Pergola posts secured in concrete footings dug into the ground of a pebble and stone yard. The raised footing keeps it out of any standing water. The concrete footing provides stability to withstand heavy winds. The missing post base trim pieces show you how bad it can look if left uncovered. However, this pergola is over 20 years old and is structurally as sound as it was the day it was built. Some fresh paint and the addition of trim pieces will make it look new in just one day. For more information on how to secure your pergola posts – read more here. Take the survey, sign up for the email instructional series and get the guide that will teach you how to build a pergola that will last as long as mine! For anyone even thinking about building a pergola, this FREE 3 week series of email lessons is exactly what you need to get started. The E-Course lessons will guide you through from the very first step in the planning process all the way to heading out to shop for materials with your own cut list and freshly drawn pergola plans. You will learn how to measure out and prepare and mark your site, find out how to obtain permits (if you need them) and meet all local regulations that are needed. You will learn what you will need to do to secure your posts to any possible surface. You will receive a free pergola plan, but then also learn how to adapt the one you receive in case it is not the exact size and design that you need. You will also learn how to draw your own pergola plans from scratch including figuring out dimensions all around and then using that to create a material cut list. At that point you should really be able to feel confident about how possible and easy it it to build your own pergola. Then you will be ready for the second part of the lessons – the ebook that provides illustrated step by step instructions on getting to the final product – your very own personally designed and built pergola. Are DIY Pergola Plans As Easy as TV Makes Them Look? This is a frequently asked question on the pergoladiy surveys. Many people watch the home improvement shows which inspire them to embark on all sorts of projects and inevitably they find out that things are not always as easy as they look on TV! However, creating your own pergola plans and then following them to build your own pergola is not one of those. Yes, it really is that easy! It is especially easy if you start off with a set of existing plans or pergola kit assembly instructions and adapt them for your own yard. This layout for the framework and base of an attached pergola is the perfect foundation to start out if you want to an attached design. It does not matter what material you will be using, or whether you will be putting your posts in the ground, on a deck or in concrete. This basic layout works for anything. 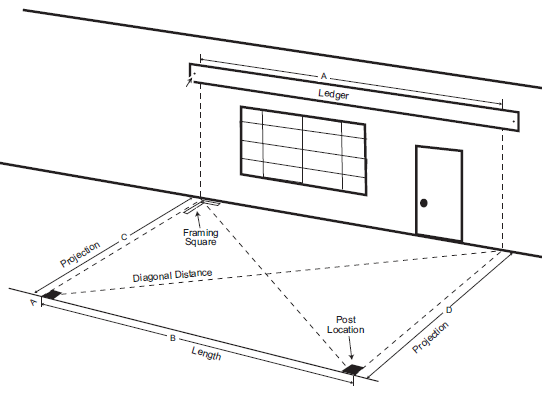 The point is to get the idea of the angles and placement in your yard. Projection means the amount of overhang that the roof edges will have. Typically, a rafter piece will project 6 inches out from the posts on both sides. That is not a hard and fast rule, just a general guideline. Just make sure you do account for that overhang when measuring out the dimensions you want. You don’t want the roof pieces to be blocking any views or hitting any trees or other structures. With a detached pergola, the layout is much simpler. It is all about here you want it in your yard, what shape and how big or small. If you already have an existing hardscaped patio area that makes your decision even easier. Just lay out the markings for post placement according to where you want it on the patio. Always check your diagonals to make sure the dimensions you set will provide straight and true edges and angles. From there it is just a matter of the style you want and the amount of shade you need. Single or double beamed? Two layers of rafters or rafters and slats? How close together? Curved or straight? 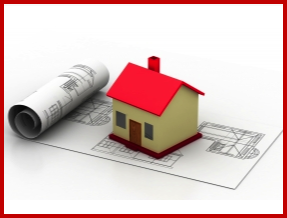 No matter what you decide on those, as long as you have your foundation drawn out, you will be set to get started. Sign up now for the best emails series of tips and tricks anywhere and you will really see how easy it is to build a pergola with your own set of pergola plans. Attached pergolas use a ledger board secured to the wall of the house in lieu of posts. These typically end up being 2 post pergolas, but that does not have to always be the case. If you have a larger patio you want to cover, then they can easily be expanded to 3 or 4 columns or even more. 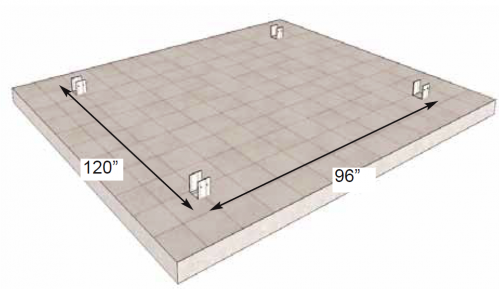 The only limitation is the roof load and not using beams so long that they would begin to sag over time. 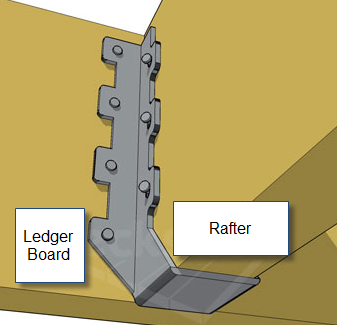 Joist hangers allow you to set the straight cut edges of the rafters into the base – to hang them you could say – as you then screw them into place. This is something to keep in mind about an attached pergola. In addition to reducing the number of posts needed, the roof pieces that will be attached to the ledger board only need to have one fancy end cut. Attached pergolas tend to be the most in demand right now and they are also the easier and cheaper alternative to a free standing design. Most houses built recently have a concrete patio poured just off of a sliding glass door to the back yard, it is quite common to want to attach a pergola over the concrete to create a shaded seating area. 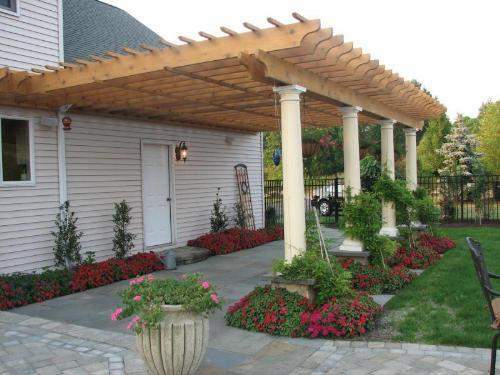 Since it is so easy to attach two posts to a concrete slab and then you save material money by reducing the number of pieces needed and not needing as many edge cuts, anyone looking to build a very lovely pergola for less than a thousand dollars can easily accomplish this with an attached design. So what question can we answer for you? In future posts we will try to address the most frequently asked questions from our surveys. Please join the more than 500 people who have signed up for our emails and taken our survey. Hopefully we will answer your most critical question next! Pergola Building Tip: Don’t Forget Post Trim Pieces! Do you want your finished post base to look like this? There is one add on to any pergola design that we recommend you do at a minimum and that is attaching some sort of trim piece to the base of the pergola to cover up the hardware used to attach your post to the ground. No matter which method you use for attaching your posts – concrete slab, concrete holes in the ground, or a deck – it really makes a huge difference if you attach trim. The top example is of a pergola post base with the aluminum post bracket left uncovered. The shiny silver metal and screws give the pergola an unfinished appearance. This is fine if you are going for a very basic, no frills look of course. However, it only takes a few minutes cover that with a very inexpensive set of trim pieces. The middle photo shows a copper plate which is a lovely blend with the stone and darker wood. The bottom photo shows a post with additional matching wood trim pieces nailed on. With the wood trim option you can experiment with the height of the trim pieces too to create different looks – again without really adding any more time to the process. When building a pergola even on a very tight budget, this is a very simple, cheap addition to the design that makes it look all that much more elegant and complete. Securing Pergola Posts – So Much Easier Than You Think! You want to build your own pergola, but I know that you, like me, are feeling a little apprehensive about getting started. Securing a post to concrete is the most common method of installing a pergola. It is also the easiest by far. 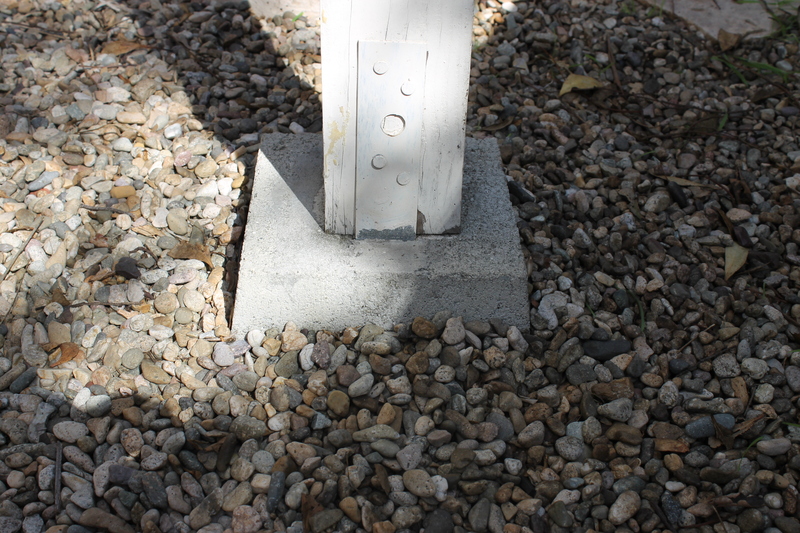 A bracket, a concrete anchor (also known as a Tapcon) bolt and then some lag bolts to attached the post to the bracket. The wood trim nailed on after is probably the most crucial step. Don’t skip it! Why? Because it is a very inexpensive few pieces of wood that make your pergola look so much more complete. No ugly exposed brackets weathering away in the elements. The treated and stained wood will last long and look beautiful. 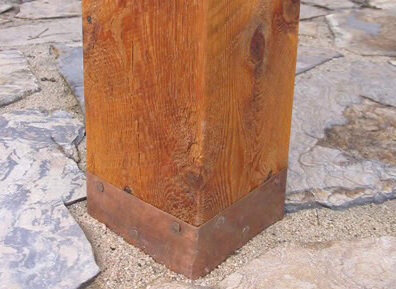 The bracket mounts also provide the recommended 1″ clearance between the concrete and the bottom of the wood post. Even with pressure treated and stained timbers of any type you really don’t want them standing in accumulated water. And unless you live in the high desert of the southwest, you know you will have times during the year when water will accumulate either via heavy rains or melting snow. No matter what type of base you will use for your pergola, the newly released version 2 of a Guide to Build a Pergola in One Weekend will describe and show you via illustrations and pictures like those above just how to tackle the foundation of your pergola project. The Guide also includes two sets of free pergola plans and it teaches you how to draw your own. Don’t miss out on this great deal! The first tip we will share with you about building a pergola is this: notches. Yes, notches. It is worth every minute that you take to gather all your roof pieces and lay them out according to your design and mark off the places where they will intersect in the pattern. This will make your life so much easier when you get to the point of securing them together. It is also a great way to ensure stability is maintained for many years. Nothing will slip out of place if they are notched together. It’s like the old Lincoln Logs you used to play with, only this time after you snap the wood pieces together you get to use a power screwdriver and bolt them together forever! Here’s what we suggest – use your jigsaw to make cut outs. Do this before you finish staining your wood. If you wood is pre-stained, then be sure and sand the newly exposed area and coat it. You don’t want those notches to be the place where moisture gets in and starts rotting away your beautiful pergola. When you are ready to start installing roof pieces you can set them in place with the notches first and then go along and start bolting them together. 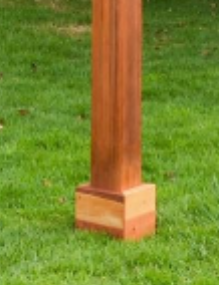 Notches are standard in any pergola kit no matter what material type. Kit manufacturers create their easy assembly process by taking care of those details for you because they know how much time it saves for installation. They can’t promise you it will only take two people one day or a few hours to put the pergola together unless they take care of these short cuts for you. The point is – follow those same steps when you do it yourself. There is a good reason for them and you will only make the process harder on yourself if you skip it. How do we know? Well, have you ever watched someone try to build a pergola without using notches? It can be quite amusing watching all the trial and error. Even worse is seeing what happens after a few years of wind storms have stressed the un-notched connections. Rafters start to separate from beams and it’s just generally a headache. You end up replacing bolts more frequently than you have to apply new stain! Don’t take that risk – use notches.